0: Number of batted balls that left the infield during James Dykstra's no-hitter for the Winston-Salem Dash on April 15, 2015. 0: Hits allowed by Jake Dahlstrand and Joe Gunkel in the Salem Red Sox's season-opening 2-0 win at Carolina on April 9, 2015. 0: Hits allowed by Mikey O'Brien on Aug. 20, 2015 during the Frederick Keys' first no-hitter since 2010. 0: Hits recorded by the Myrtle Beach Pelicans during a five-run seventh inning in an 11-1 win at Potomac on May 30, 2015. 0: Hits allowed by Lynchburg Hillcats pitching coach Rigo Beltran for the Arkansas Travelers on April 10, 1994. .400: Career batting average against Hall of Famer Randy Johnson by Potomac Nationals hitting coach Luis Ordaz. .500: Career batting average against Hall of Famer Pedro Martinez by Wilmington Blue Rocks hitting coach Abraham Nunez. .557: Winning percentage by Philadelphia Phillies skipper Pete Mackanin in 1993, his lone season as Frederick Keys manager. It's still the highest in team history. .662: Winning percentage by the Winston-Salem Dash in the second half of the 2015 season. 1: Game-winning RBIs in the 1990 World Series by new Salem Red Sox manager Joe Oliver. 2.87: Carolina League-leading ERA recorded by 2015 National League Cy Young Award winner Jake Arrieta for the Frederick Keys in 2008. 3: Triple plays recorded by the Wilmington Blue Rocks during the 2015 season. 3: Pinch-hits recorded by Carolina Mudcats hitting coach Carlos Mendez in 2003, his lone season in the Major Leagues. 4: Strikeouts recorded in the sixth inning of his Carolina League debut by top Nationals prospect Lucas Giolito on May 20, 2015. 4: Errors committed by Potomac pitcher Phillips Valdez on June 4, 2015 in a 13-1 loss to Salem. 4: Major League complete games recorded by Winston-Salem Dash pitching coach Jose Bautista. 5: Hits and RBIs for Potomac's Wilmer Difo on April 18, 2015. 5: Players selected before Frederick Keys hitting coach Erik Pappas in the 1984 First-Year Player Draft. 6: Strikeouts recorded by Salem Red Sox pitching coach Paul Abbott in his only Major League complete game on May 28, 2001. 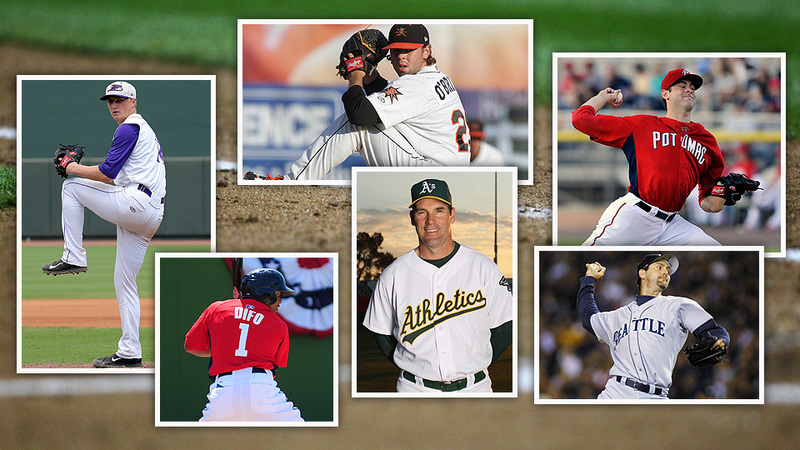 7: Former Carolina Mudcats who were named 2015 Major League All-Stars. 9: Years between Carolina League batting champions (Chesny Young, 2015; Carl Loadenthal, 2006) for the Myrtle Beach Pelicans. 10: Offensive categories (batting, runs, hits, homers, triples, doubles, total bases, RBIs, slugging and on-base percentage) in which the Lynchburg Hillcats led the Carolina League in 2015. 15: Years between Mills Cup championships for the Myrtle Beach Pelicans, who won the championship in 2015. 17: Players drafted before new Wilmington Blue Rocks manager Jamie Quirk in the 1972 First-Year Player Draft. 25: Consecutive wins recorded from 1991-92 by Frederick Keys pitching coach Kennie Steenstra, who still holds the Wichita State record. 28: Consecutive scoreless innings pitched by Lynchburg Hillcats relievers in August 2015. 51: Extra-base hits for Nellie Rodriguez of the Lynchburg Hillcats en route to earning 2015 Carolina League MVP honors. 53: RBIs for 2015 World Series MVP Salvador Perez in 2010, his lone season with the Wilmington Blue Rocks. 76: Major League games managed by new Winston-Salem Dash skipper Joel Skinner. 110: Number of sellouts by the Winston-Salem Dash since BB&T Ballpark opened in 2010. 174: Major League stolen bases by Myrtle Beach Pelicans hitting coach Mariano Duncan. 1,223: Career wins by new Frederick Keys manager Keith Bodie. 1,257: Career wins by new Carolina Mudcats manager Rocket Wheeler. 1,936: Career wins by Myrtle Beach Pelicans manager Buddy Bailey. 2,788: Size in square feet of "Mudzilla," the 82-foot-wide videoboard at Five County Stadium in Zebulon, N.C.
328,789 -- Fans who attended Frederick Keys games in 2015, the highest attendance at the Class A Advanced level.